Description of "Forgotten Atrocities: Memoirs of a Survivor of The 1947 Partition of India"
Bal K. Gupta was born in Mirpur, Pakistan Occupied Kashmir (POK), and is one of the survivors of thenotorious concentration camp called Alibeg Prison. This is his eye witness account of the Pakistan invasion of Mirpur in 1947, where about 20,000 Hindus and Sikhs were mercilessly killed – including two dozen of his close relatives. Bal Gupta and his family were held captive in the Alibeg Prison along with about 5,000 Hindus and Sikhs prisoners. He was one of the surviving 1600 prisoners that were liberated by International Committee of the Red Cross (ICRS) in 1948. At the time of the invasion, he was 10 year old. His memories are supported by many eye witness accounts of fellow prisoners and by research conducted on many independent historical documents. Bal Gupta interviewed many survivors by telephone and in person in India, England and the United States of America (USA). Bal Gupta vividly narrates the atrocities committed on helpless Hindu and Sikh men, women and children during the partition of India in 1947. 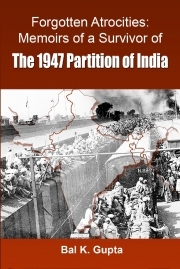 Reviews of "Forgotten Atrocities: Memoirs of a Survivor of The 1947 Partition of India"